There is nothing cuter than a little puppy which is this gorgeous ball of fluff and is just so cuddly and soft to hug. But then it happens, they start to grow and so does their hair and before you know it, you are asking yourself the question, do I take my dog to the dog grooming salon for a haircut or do I have a go at cutting my dog's hair. This is where we hope we can assist you in deciding. For sheer convenience the dog grooming salon is usually preferred by most people. Most of you have probably thought that this is best left to the professionals anyway. Proper pet grooming involves, complete skin and coat care, nail trimming, ear cleaning and haircut. After all it is as easy as dropping your dog off and picking them up again after a couple of hours. In that time your dog would have had a bath, haircut, blow dry, brush and nail trim. All you need to do is pay for the service and take your dog there every 3 months or so. There is even mobile dog grooming services for convenience. They come to you! For those who have the extra time and want to save money, grooming and cutting your dog's hair yourself is an option worth considering. If so, it is a good idea to start handling your dog from a very young age, with regular bathing, brushing, combing and nail trimming so it will be used to being handled and stand still whilst being groomed. Follow our easy dog grooming tips to get started. Shower your pet with personalized affection with our exclusive Pampered Pet© Personalized Pet Towel! 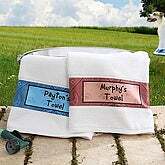 Our durable, white 100% cotton pet towel is printed with your dog's name in your choice of our red or blue bandanna print. Towel is perfect for bath time or makes a great accessory in a gift basket for a new dog owner or pup's birthday! Have a question about grooming your dog, then ask us! Is your dog just 'a bit on the nose'? Haven't got time to wash the dog! Always have a container of Baby Powder handy. Just sprinkle the powder all over your dog's coat. Any odours will adhere to the powder particles and will be removed when the powder is brushed from the dog's coat.